Getaway with your girlfriends before the Holiday rush! On December 5th, businesses Bellevue, Kentucky are hosting an event that is a perfect excuse to escape with your girlfriends before the hustle and bustle of the season gets out of control. Let's face it, the shopping and gatherings are already starting but you owe it to yourself to make some time for just you and your friends to recharge your batteries. You will be a better momma and wife I promise! If you are a fan of Gone with the Wind this event is one that shouldn't be missed. 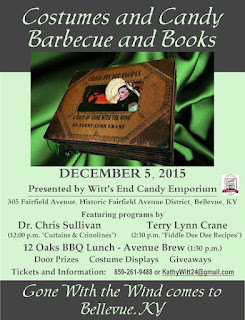 The event is called Costumes & Candy, Barbecue & Books: Gone With the Wind Comes to Bellevue, KY. This event gives Gone with the Wind lovers a chance to learn about the costumes used in the film and see replica gowns up close and personal! At noon head to Mama C's Buttercream & Sprinkles to hear from Christopher Sullivan who is a leading expert on Gone with the Wind. He will share how the costumes were designed and what happened to them after the film was produced. Avenue Brew will be serving 'a twelve oaks barbecue' and dessert will be chocolates and confections provided by Witt's End Candy Emporium. After lunch, author Terry Lynn Crane will present "A taste of Gone with the Wind" at the candy shop. Her new book is called Fiddle Dee Dee Recipes: A Taste of "Gone with the Wind" It is a collection of recipes from the 1800s and some recipes that were used at her bed and breakfast Tarleton Oaks. See I am telling you, this event would be fantastic to attend with your girlfriends! Have tea with Mrs. Claus! Last Call for Family Adventure Day!